Sean Carow, Chad Malone and Eric Watson conducted a law enforcement seminar at the Metropolitan Police Department Academy in Washington, DC. 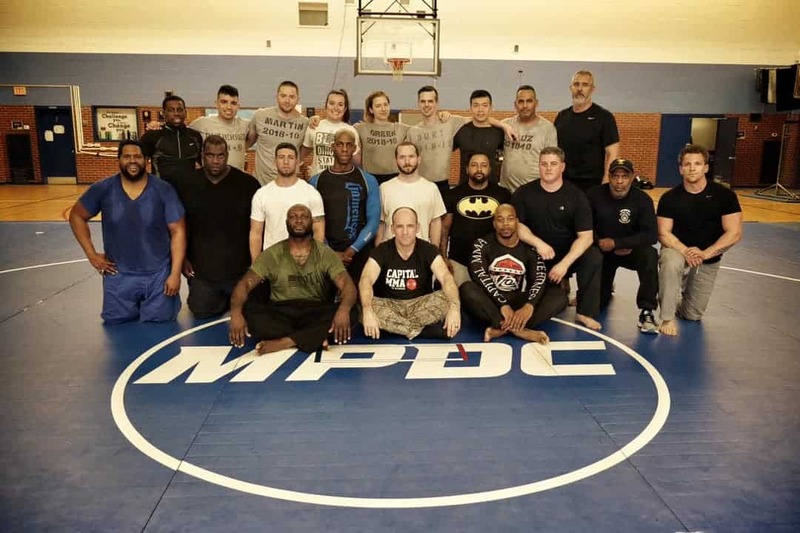 The purpose of this seminar was to introduce law enforcement personnel to the proven strategies and techniques of Capital MMA’s Gracie Brazilian Jiu-Jitsu program. Of course officers should NEVER grapple with suspects by choice. Fighting in full law enforcement gear can be dangerous because a suspect can access the officer’s weapons. However, in the event that a fight occurs against an officer’s will, it is essential that they are prepared to handle the incident appropriately. Officer’s must also learn to use the minimum amount of force necessary to gain control of a person. Handcuffing should follow once an officer gains compliance. Washington DC police officers were taught distance management, grip breaks, control against strikes, dealing with a fleeing suspect, taking a suspect to the ground, maintaining proper positions on a grounded suspect, and properly reversing inferior positions. Law enforcement seminar at the Metropolitan Police Department Academy in Washington, DC.